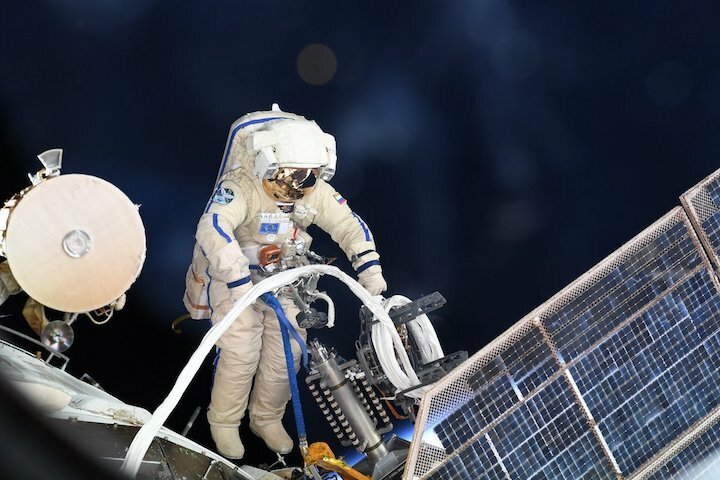 Russian cosmonauts Oleg Artemyev and Sergey Prokopyev are carrying out their second ‘Russian’ spacewalk this year outside the International Space Station, sources from the Mission Control Center outside Moscow have told TASS. "The exit hatch of the Pirs docking module opened at 19:17 Moscow time. The cosmonauts’ spacewalk will last for about six hours and ten minutes," the Mission Control Center said. During their extravehicular activity, the Russian cosmonauts will conduct a next stage of the Test experiment. They will dismantle containers with microorganisms installed on the ISS modules Poisk and Pirs in August 2017 that will later get back to Earth. The experiment is aimed at examining time restrictions for viability of microorganisms in open space to decide where they come from. 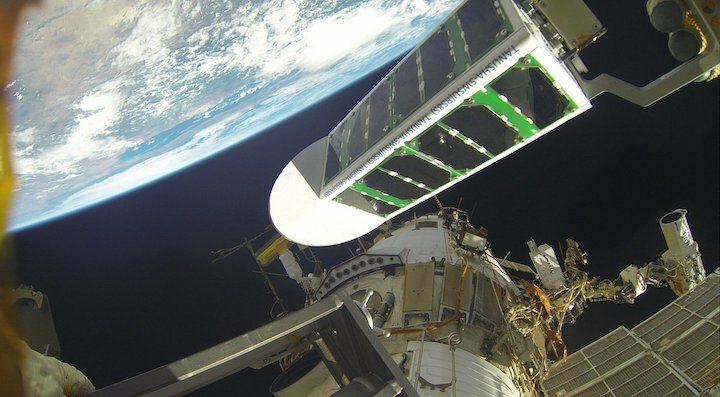 The cosmonauts are also expected to install equipment on the external surface of the International Space Station for the ICARUS experiment on monitoring wild birds. Floating outside the ISS, the cosmonauts have already deployed Russian satellites SiriusSat-1, SiriusSat-2, and two Tanyusha SWSU satellites designed at Southwest State jointly with enterprises of the missile-space industry. Ending their spacewalk program, they will take panorama pictures and shoot panoramic video within the framework of the Space 360 project. 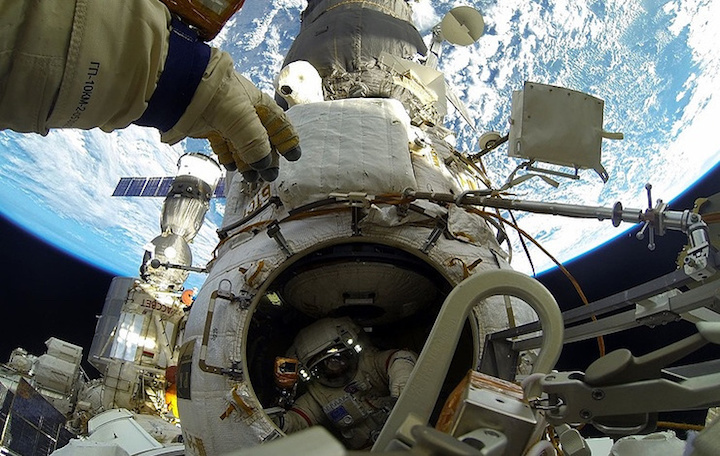 Last time the Russian cosmonauts conducted their spacewalk was on February 2-3. 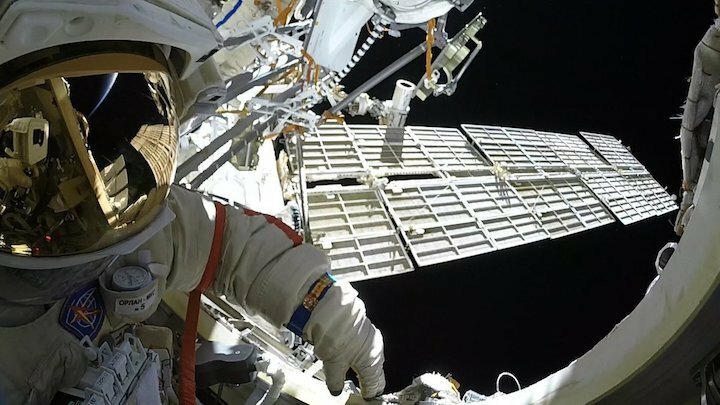 Alexander Misurkin and Anton Shkaplerov set a new record for Russian cosmonaut by spending 8 hours and 13 minutes outside the station. 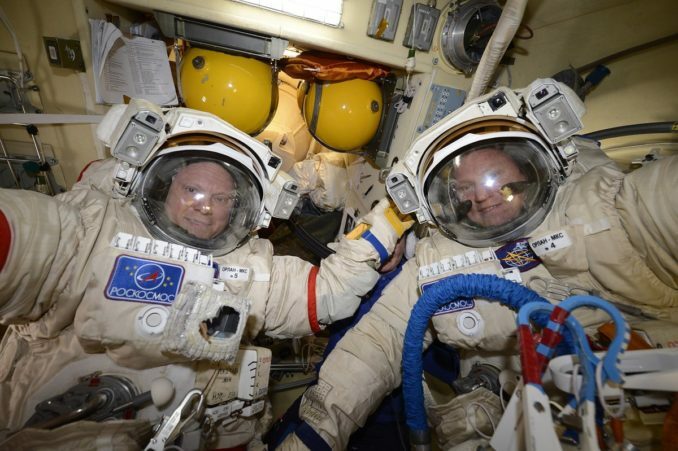 The 7-hour, 46-minute excursion by Russian flight engineers Oleg Artemyev and Sergey Prokopyev began at 1617 GMT (12:17 p.m. EDT) as they opened the hatch to the station’s Pirs airlock. The spacewalkers’ first task as the deployment — by hand — of four CubeSats built by Russian students. Prokopyev tossed the four nanosatellites into space by hand just outside the Pirs airlock, using a manual release method used on previous Russian spacewalks. The duo recorded video of the deployment for Russian media. 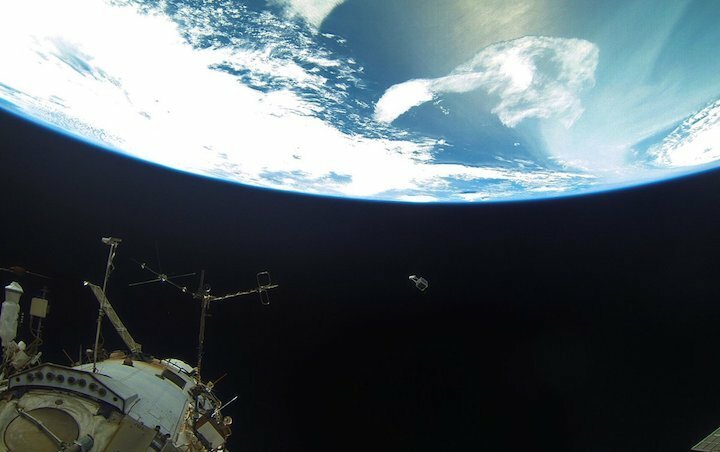 The CubeSats were launched earlier this year inside Russian Progress supply ships. “Entered into a database, the aim is to help protect animals, better understand Earth’s climate and the spread of diseases as well as helping to practice more sustainable agriculture,” said Johannes Wepple, Icarus project manager at DLR. The spacewalkers set up an antenna boom, routed and mated numerous cables and connectors, and installed the Icarus antenna. Other tasks planned for Wednesday’s spacewalk included the retrieval of four materials exposure packages from the hull of the Zvezda service module. But with the cosmonauts behind schedule, mission controllers Korolev, Russia, near Moscow, instructed Artemyev and Prokopyev to only pick up two of the sample canisters, leaving the other two for retrieval on a future spacewalk. Russian ground controllers also elected not to send the spacewalkers to accomplish any bonus work after they wrapped up their primary tasks. Artemyev and Prokopyev collected their equipment and headed back to the Pirs airlock, where they closed the hatch at 0003 GMT Thursday (8:03 p.m. EDT Wednesday) to officially conclude the spacewalk. The excursion ran nearly two hours over the planned timeline, ending up 27 minutes short of the record for the longest Russian spacewalk in history, a mark set in February by another pair of station cosmonauts. 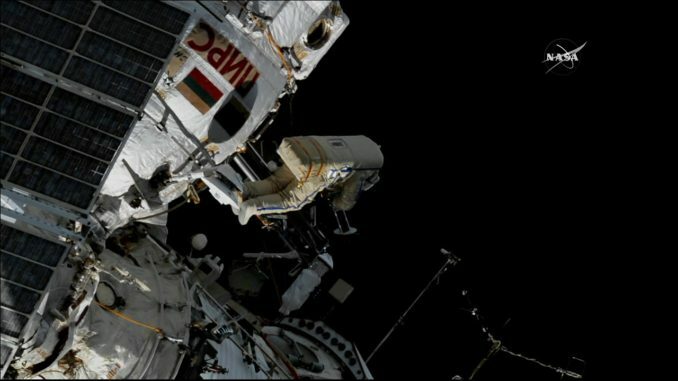 Wednesday’s spacewalk was the third in Artemyev’s cosmonaut career, and the first for Prokopyev. It was the 212th spacewalk dedicated to assembly and maintenance of the International Space Station since 1998, and the 55th staged from the station’s Russian segment. With the completion of his third spacewalk, Artemyev has logged 20 hours, 20 minutes, of spacewalking time. The next spacewalks outside the space station are planned for Sept. 20 and Sept. 26, when commander Drew Feustel, NASA flight engineer Ricky Arnold, and German-born European Space Agency astronaut Alexander Gerst will replace aging batteries on one of the research lab’s power truss modules with fresh units due to be delivered by a Japanese HTV supply ship next month. Freunde, ich Teile mit Ihnen das Filmmaterial, das ich und meine Kollegen während der Einführung des Open Space am 15. August gemacht haben. Fast 8 Stunden flogen wir unbemerkt, und Sergey und ich haben alle Aufgaben erfüllt, die uns übertragen wurden.